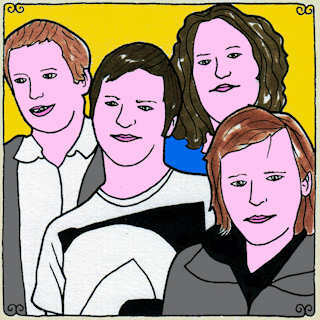 Seafarer made their way on to Daytrotter this week. The band performed four tracks from their new ep Hiding Places. The band will be performing a free show at The Whistler on Jan. 23rd and at Empty Bottle on Jan. 28th. The Deli is proud to present this in-depth interview with Michael Bernier of Michael Bernier of the UPRISING. Bernier was one of last years winners in the Best of New England Emerging Artists 2009 Poll and is also a contender this year. Though a native of the Boston area, Michael Bernier would prefer to consider himself a citizen of the world; content to tramp the Earth in search of peace and enlightenment, and expressing those sensibilities through his music. Michael took some time out before embarking on his solo acoustic winter tour to talk about his music, personal philosophies, and his bandmates in The UPRISING. Deli: In a band setting that brings vastly different musical tastes, I wondered aloud how those differing tastes find their way into the music of The UPRISING. MB: There is definitely a great variation of musical tastes in within The UPRISING....each member is perhaps drawn towards a specific genre as far as their playing style or writings. I am deep into Reggae and Singer/Songwriter stuff, RyBomb (Michael’s brother and bassist, Ryan Bernier) is into Jazz and Jam, Katie (saxophonist, Kate Berlent) is into Jazz and Acoustic Rock, F (drummer, Mark F) is into Metal and Grunge, Moore (guitarist, Mikey Moore) is into Classic Rock and Motown. I would say that overall everyone tunes into music that they think is good and real...regardless of genre...the music that makes you feel that emotion you need...the song that takes you away and makes you forget that you are still driving in that smelly van. Though a native of the Boston area Michael Bernier would prefer to consider himself a citizen of the world; content to tramp the Earth in search of peace and enlightenment, and expressing those sensibilities through his music. Michael took some time out before embarking on his solo acoustic winter tour to talk about his music, personal philosophies, and his bandmates in The UPRISING. Our different tastes in music, and our individual influences help us to create this unique sound that The UPRISING has become known for. There are no boundaries in this world...no limitations...we recognize that and embrace it like the road. Deli: Anyone who follows Michael Bernier and The UPRISING knows that there are two faces to the music; Michael’s solo, singer/songwriter-based material, and The UPRISING’s full-on band material. I wanted to find out how Michael balances to two opposing tendencies; those of a solo artist with those of a bandmate. What I learned is that the key, at least for Michael and the band, is keeping the two separate, almost separate career paths entirely, each serving its own unique purpose. MB: I came up as a singer/songwriter in the New England music scene...this is my foundation...my drive...it definitely shaped the performer I am today...but as time went on and the shows got bigger and bigger, it was a natural progression to develop the band...to build the band around the music I was creating at that time. To keep the balance between organic roots rock concerts with the band and the solo acoustic performances that led me to this point...I continue on with both...The UPRISING has its place and my solo career has a completely different place...although often times it is a solo acoustic performance in some far way city in the United States that gets the foot in the door for the band to perform...for example in places like SXSW...I was invited last year to play some solo acoustic performances...and this year the band is looking at some great offers to play. As far as keeping the acoustic music and the band separate here in New England...they are different scenes...the band is huge...packing in large venues....bringing the high energy and full sound...my acoustic career is intimate...it stays in the singer songwriter circuit and the venues that come with that...In many ways they are one in the same....but I still completely separate the 2 as far as performances and recording...We just finished a full length album 'Do Not Write To Me Here' with the whole group...and now I am right back in the studio working on an acoustic album titled 'The Road' to support my acoustic U.S. Winter Tour this February. Deli: Michael Bernier has developed a reputation not only for his cathartic performances, but also for his relentless positivity. How do these features of his music and live performances make their way into his day-to-day life? MB: Live is a ever-changing...living is some mystery...I enjoy my days...I stay even and realize that everything is alright...I am breathing...people are good...I am all about everyone getting down together and putting aside ego and materialism when performing and when skating down the street on a one way in the wrong direction. Outside of music I practice yoga...I eat organic food...I stay healthy...I do not follow the path just because there may be one...I trail-blaze if it is what I need for greater existence and heightening...I stay clear of false judgment and see the goodness that each person has within them...I talk to people I don’t know...I put forth a blunt honesty and speak reality. I let people know what I love about them...I tell people when the make me happy...I positively tell them when they are making me sick...I pursue the things that I want...I criticize constructively...I become the change I want to see instead of procrastinating...I make moves that are for the betterment of the world and all its people and animals...for the betterment of all living things...I am a naturalist...I live off fruits and vegetables...I recognize that my body is my temple....I see myself as no greater than anything...I remain barefoot...I am no more important to this entire planet than the chicken that roams free...or the cow in a cage....or the homeless woman dwelling in the gutter...we are all one in the same...I spend months alone in the woods...I do what seems to create a higher energy for myself...stay in tune with the bliss...find it...and live in it...It is all peace....I hold my ground...I am man...living and breeding a good vibe...a positive outspoken approach at unity. Deli: For more than 10 years, Michael Bernier and his bandmates in The UPRISING have been building their legacy, steadily growing their fanbase through hard work and throwing everything they have behind their live performances. What’s next? Where does the band go from here and how do they get there? MB: We continue to make music...the shows continue to get bigger along with our unbelievable grassroots following...we ride the tide...we let everyone know how excited we are to keep on doing this...we speak about our appreciation for our fans and friends and supporters...we smile and say thank you every time a new station starts spinning our music...we recognize the love each time a magazine writes about us or someone orders merch off our website...we continue to grow and put in hours and hours of work each day to feed this life we are leading within music. What's next? I am heading on an acoustic tour across the United States from Jan 29th - March 2... with shows in NH, MA, NY, NJ, PA, DC, VA, NC, GA, FL, LA, TX and CA...laying the groundwork for the bands tour next fall. At the same time we are working on a college radio campaign in the United States and Canada, touring the new album with the band, starting a new UPRISING album, writing...and enjoying our lives.